25 years, 4 months, 16 days old age. Ankit Rajpoot will turn 26 on 04 December, 2019. Only 7 months, 13 days, 22 hours, 14 minutes has left for his next birthday. Ankit Rajpoot has celebrated the total number of 25 birthdays till date. See the analysis by days count and bar graph. Ankit Rajpoot was born on 04-12-1993 in Kanpur in the state of Uttar Pradesh, India. He is an Indian Cricket Player. 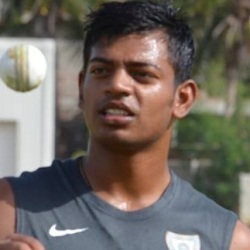 A lanky Indian fast bowler who hails from Uttar Pradesh is another IPL prodigy. He made his first class debut in the year 2012 representing his home state UP. He had a fruitful debut season and ended up becoming the second highest wicket-taker that season. He was roped in Chennai Super Kings the following season. After a poor run, he missed out on selection for the rest of the season. He then battled with form and injuries for next couple of seasons and then came Syed Mushtaq Ali trophy 2016. He was the highest wicket-taker and eventually won himself an IPL contract worth 1.5 crores with Kolkata Knightriders. He was Gambhir’s go-to man during death bowling. His variations troubled a lot of batsmen. His name was doing the rounds before the 2018 IPL player auction and he was finally sold to Kings XI Punjab for INR 3 crores. After warming the bench for initial few games, he proved his mettle by winning his side matches with some great fast bowling. He in the process made the best figures by an Indian fast bowler in the IPL by picking 5-14 against SRH. However, his heroics couldn’t win his team the match. He had a good outing at the Syed Mushtaq Ali T20 competitions in 2019 and his franchise expected him to deliver the same in IPL as well. He didn't disappoint and bowled with good accuracy and pace. He struck at the crucial time and won his team matches. With time and age on his side, he can surely make it to the national team soon. He is married to Maahi Singh since 2017. He was also selected in India A team that toured South Africa. He along with his wife appeared on the show called Gionee Kouple Goals. Thus far, he has played for 3 IPL franchise. He holds the record for best figure by an Indian fast bowler in the IPL.